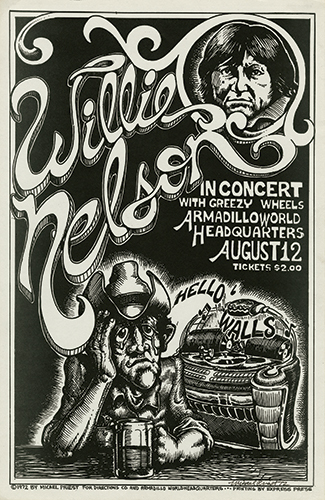 In the early ’70s, the Armadillo World Headquarters was the epicenter of Austin’s growing live music scene and a favorite Longhorn hangout. Housed in an abandoned National Guard armory, the venue lacked air conditioning and openly tolerated marijuana use. Admission was cheap, but chairs were limited, so most patrons sat on a patchwork of carpet. After the show, Nelson attended a party thrown by writers Edwin “Bud” Shrake and Gary Cartwright at the Crest Hotel with family and friends, including Coach Darrell K Royal, Nelson’s good friend and occasional golf partner. Nelson biographer Joe Nick Patoski described a scene from the hotel room when, during a guitar-picking session, Royal nearly expelled Cartwright for talking while Nelson played. “Leave or listen,” Royal told him, and naturally, Cartwright obeyed. The success of that show led to more bookings and marked a turning point in Nelson’s career. He grew out his hair and his next album, Shotgun Willie, diverged from the traditional country sound. Image courtesy the Dolph Briscoe Center for American History at The University of Texas at Austin.